All transactions are safe and secure with a reliable history in online purchasing behind each of our associates. 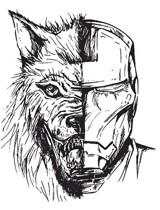 Buy the Iron Man Two Starks t-shirt to own Iron Man clothing and merchandise. This design is a mash-up of Iron Man and the popular Game of Thrones TV show. This Iron Man t-shirt features the face of Tony Stark from the Iron Man movie next to Jon Snow of House Stark from HBO's Game of Thrones. Perhaps if Jon Snow had the superhero's armor and chest power cell, known as the Arc Reactor, he would be better able to defend the Wall. In any case, this creative design is the next best way to unite the two Starks. In addition to the Iron Man Two Starks tee above, browse the Iron Man Clothing Gallery for more apparel like men's and women's clothes, kids shirts or hoodies.